The Predator XB1 from Acer features a WQHD 2560 x 1440 resolution offering four times the resolution of 720p HD for a crisp clear picture. The IPS display also supports a 4 ms response time to reduce ghosting when gaming or viewing videos and a 1,000:1 contrast ratio to provide deeper dark and brighter bright colors. On the back of the monitor you will find a single HDMI connector and USB port as well as two speakers to provide an immersive multimedia experience. Once configured, the display can be adjusted up and down, up to 5", for maximum viewing comfort. This IPS display features technology designed to provide rich color and you can even overclock it up to 165 Hz for an enhanced gaming experience. Get a smooth gaming experience with NVIDIA G-SYNC. 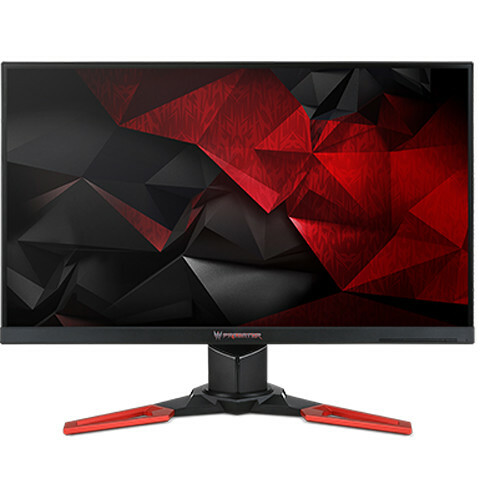 G-SYNC virtually eliminates screen tearing and minimizes stuttering by syncing the refresh rate of your monitor with the frames rendered by your GPU. Take charge of any situation with Predator GameView. Adjust dark boost levels, make precise color adjustments, and set up aim points for hip-fire accuracy. Save custom settings in three profiles you can switch between at any time. Good color brings game worlds to life and lets you pick out enemies with precision. For enhanced color accuracy this XB1 series monitor covers up to 100% of the sRGB color space. Dimensions: 27" x 19.5" x 7.75"